About half an hour ago as of this writing, Nintendo finished their (first?) E3 Nintendo Direct, showing off several games that, to be honest, we all kind of expected to see. There’s a new Mario Kart, and a new Smash Bros.. Those games will be great, I have no doubt, but the game I was hoping to see was luckily shown: Xenoblade: Chronicles’ spiritual successor, so far known only as X. There wasn’t any “live” gameplay in the pre-recorded Nintendo Direct video, so we’ll just have to settle for a trailer, but like when X was revealed earlier this year, I got all goosebumpy and excited. The video starts off with a man walking through a hanger for mechs, getting in one, and turning it on. Some shots of a futuristic city follow, with the same character walking down a street. Following are gameplay shots of the character running throw fields of monsters, in and among large dinos, and traversing the landscape in his mech that…turns into a tank/car thing. The next scene shows the mech flying around the world around giant monsters and walking with what certainly looks to be coop players (the Player 2, Player 3, Player 4 labels indicate as much). Finally, a short space battle is shown. 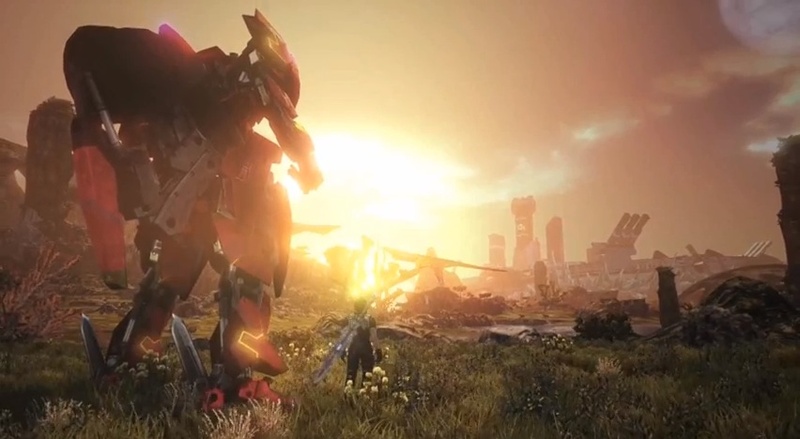 Taken without the history and gameplay I know from Xenoblade, this trailer might actually not do a lot for me. I am not the biggest fan of mechs. But having played through Xenoblade, I cannot be more excited for this game. All we know is that it’s coming out in 2014, so let’s hope it is early 2014.